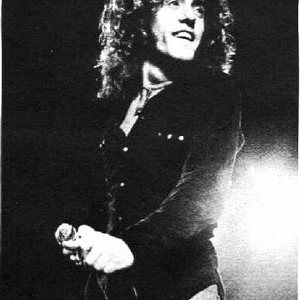 Roger Harry Daltrey, CBE (born in Hammersmith, London, England on 1 March 1944) is a popular music artist, best known as the founder and lead singer of the English rock band, The Who. He has enjoyed a less successful solo music career, and has acted in a large number of film, theatre and television roles. Daltrey and his second wife, former model Heather Taylor, have two daughters, Rosie and Willow, and a son, Jamie. They have four grandchildren, Lily, Lola, Ramona and Scarlett. He had a son, Simon, with his first wife Jacqueline Rickman, who he married in 1964. Daltry also had a son from his relationship with model Elizabeth Aronssen named Mathias, born in 1967. Daltry has dated Ann Margaret, Regina Russell and Geraldine Edwards. Daltrey was born in the Chiswick area of London, the same working class suburban neighbourhood that produced fellow Who members Pete Townshend and John Entwistle. He showed academic promise as a child in the English state school system, ranking at the top of his class on examinations that led to his enrollment at the Acton County Grammar School for boys. His parents, Harry and Irene, hoped he would eventually continue on to study at a university, but obeying the rules and learning from his teachers were not in the plans of the self-described "school rebel." He made his first guitar from a block of wood and formed a band called, "The Detours." When his father bought him an Epiphone guitar in 1959, he became the lead guitarist for the band. Soon after, interested in nothing but rock and roll, he was expelled from school. He became a sheet metal worker during the day, while practising and performing nights with the band at weddings, pubs and men's clubs. At the time, the band included Daltrey on lead guitar, Pete Townshend on rhythm guitar, John Entwistle on bass, Doug Sandom on drums and Colin Dawson on lead vocals. After Colin Dawson left the band, Daltrey switched to vocals and Townshend to lead guitar. Early on, Daltrey was the band's leader, earning a reputation for using his fists to exercise control when needed, despite his small stature. According to Townshend, Roger "ran things the way he wanted. If you argued with him, you usually got a bunch of fives." He generally selected the music they performed, including songs by The Beatles, various Motown artists, James Brown, and other rock standards. In 1964, he also helped decide on a new name for the group that had been suggested by Townshend's roommate, Richard Barnes ? "The Who." With the band's first record deal in early 1965, Townshend began writing original material and Daltrey's dominance of the band began to recede. (Their second single, Anyway, Anyhow, Anywhere was the only song on which Daltrey and Townshend collaborated.) As Townshend developed into one of rock's most accomplished composers, Daltrey's vocals became the vehicle through which Townshend's visions were expressed, and he gained an equally vaunted reputation as an incomparably powerful vocalist. His habit of swinging the microphone around by its cord on stage became a signature sign of his exuberance. Daltrey's stuttering expression of youthful anger, frustration and arrogance in the band's breakthrough single, My Generation, captured the revolutionary feeling of the 1960s for many young people around the world and became the band's trademark. Later, his scream near the end of Won't Get Fooled Again became a defining moment for the band. Yet, in the midst of the band's success, Daltrey repeatedly found himself fighting to keep the other members of The Who away from the drug and alcohol dependence that he believed would destroy them. He once flushed drummer Keith Moon's pills down the lavatory and, when Moon protested, knocked him down with one punch. Later, in October, 1973, with Townshend at a low point after struggling through the Lifehouse and Quadrophenia projects while Daltrey was experiencing some success with his solo projects and acting roles, tension between the two created more sparks. During a recording session (in an incident that Daltrey claimed was overblown), Townshend whacked the singer over the head with his guitar and Daltrey responded by knocking Townshend unconscious, again with a single blow. With each of The Who's milestone achievements, Tommy, Who's Next, and Quadrophenia, Daltrey was the face and voice of the band as they defined themselves as the ultimate rebels in a generation of change. When Tommy appeared as a feature film in 1975, Daltrey played the lead role and was nominated for a Golden Globe Award for "Best Acting Debut in a Motion Picture". While he has always considered The Who his primary ambition in life, Daltrey has released eight solo albums. 1973's Daltrey was not the first solo release by a member of The Who, following albums by both John Entwistle and Pete Townshend. The top single off the album, "Giving It All Away," reached number five in the UK and the album, which introduced Leo Sayer as a songwriter, made the Top 50 in the United States. The emotional range displayed in Daltrey proved that the singer was capable of operating outside the context of The Who and of expressing his own moods, not just Townshend's. When Sayer launched his own career as an artist, Daltrey called on a widening group of friends to write for and perform on his albums. Paul McCartney contributed the new song "Giddy" to "One of The Boys", where the band included Eric Clapton, Alvin Lee and Mick Ronson. McVicar was billed as a soundtrack album for the film of the same name, which Daltrey co-produced and starred in. But since it featured all the other members of The Who ? Townshend, Entwistle and Kenny Jones ? it could almost have passed as a Who album. McVicar included two hit singles, Free Me and Without Your Love and was Daltrey's best-selling solo recording. The title track to Under a Raging Moon was a tribute to Who drummer Keith Moon, who died in 1978. Each of the album's tracks, including "Let Me Down Easy" by Bryan Adams, expresses the frustration of growing older as only a man who sang "Hope I die before I get old" can. On Rocks in the Head, Daltrey is credited (along with Gerard McMahon) for co-writing seven of the eleven tracks. Daltrey celebrated his fiftieth birthday in 1994 by performing at Carnegie Hall in a show called, "Daltrey Sings Townshend," accompanied by The Juilliard Orchestra, Townshend, Entwistle, Irish dancers and a group of folk musicians. Later he had a short weekly series on BBC Radio 2, presenting a personal choice of rock'n'roll.